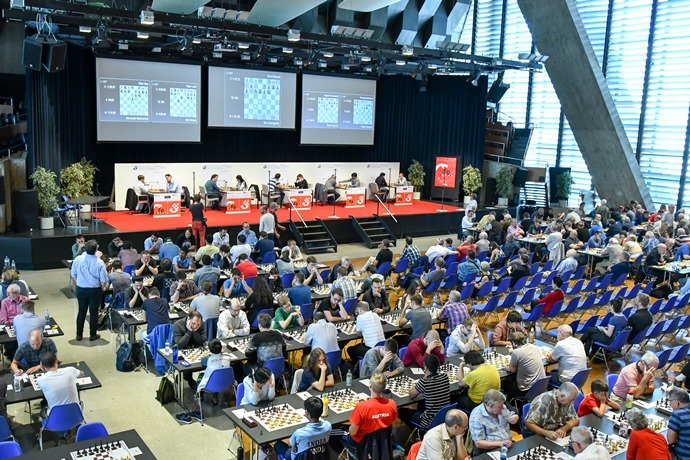 The 50th Biel Chess Festival has brought some chess legends back into the limelight, with former champions Anatoly Karpov and Vlastimil Hort playing in the opening rapid knockout, while 65-year-old Rafael Vaganian is playing in the main 10-player round-robin. 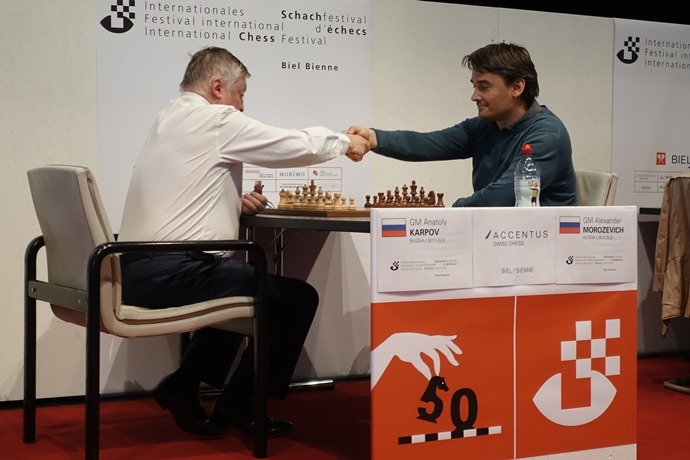 Perhaps the highlight so far, however, has been 3-time Champion Alexander Morozevich. 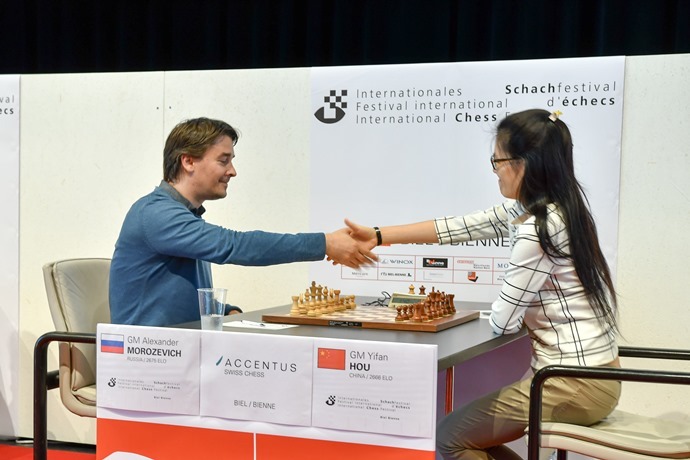 He’s played three spectacular games, even if his sacrifice in Round 1 backfired against Hou Yifan, who currently leads with Ruslan Ponomariov and Etienne Bacrot. In 2017 the romance didn’t last long, with all the legends losing in the quarterfinals. 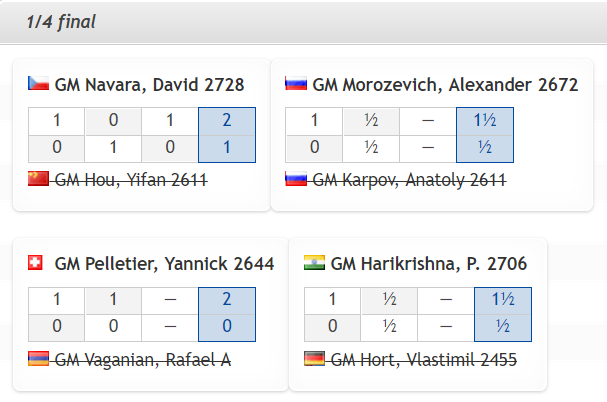 Vaganian was beaten up by Pelletier, Hort blundered into mate against Harikrishna and Karpov lost on time to Morozevich in a roughly equal position. 21.Ng5!, when of course 21…Kxh6 would lose on the spot to the 22.Nxf7+! knight fork. The women’s no. 1 kept finding little tactics until she won in 37 moves and had forced Armageddon. 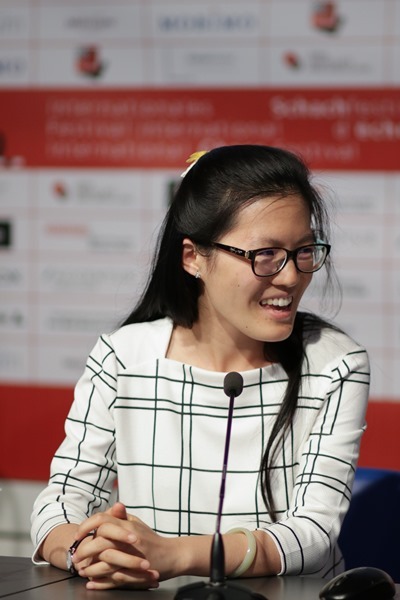 That was the end of the road for Hou Yifan, though, since Navara had White and won smoothly both on the board and on the clock. To put up any resistance Hari had to go for 33…Rxa5, but it’s understandable 34.Nb3! didn’t appeal to him. Instead after 33…Bc4 White had two open files and could play 34.Rb8+ (it doesn’t matter which rook starts) 34…Kh7 35.Ree8 and there’s no way to stop mate. Navara held comfortably in the second game with Black to win the tournament. 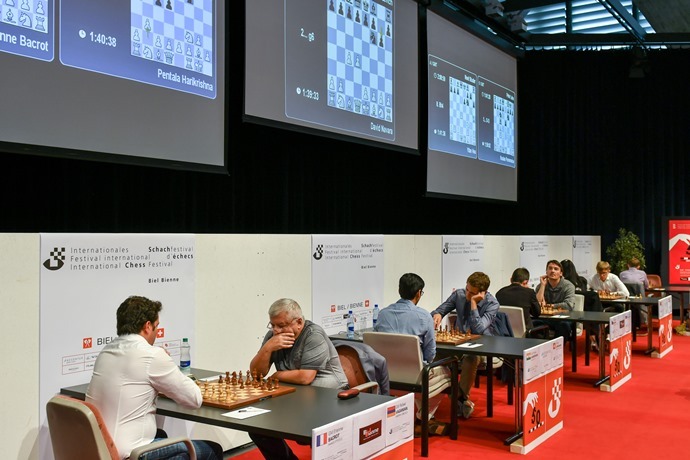 This year’s main Biel tournament is a 10-player round-robin, a welcome return to a tournament formula after last year’s Maxime Vachier-Lagrave vs. Svidler match. 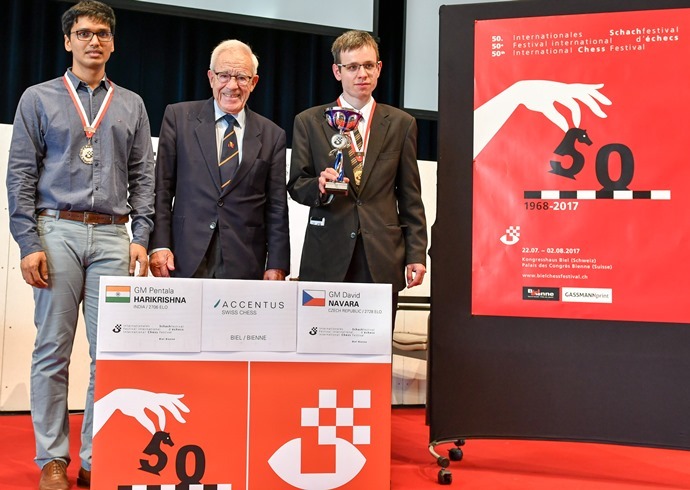 Defending champion MVL is absent, as are other Top 10 stars, with the top seeds 2737-rated world nos 21 and 22 Navara and Harikrishna. The line-up is an interesting mix, though, with the women’s no. 1, former elite tournament regulars Ponomariov, Leko and Morozevich, Bacrot, two young Swiss players and, of course, Vaganian. 17.Nxd5! looks to have been a correct sacrifice, though gradually after 17…exd5 18.e6 Nf8 19.exf7+ Kxf7 20.h6!? Morozevich began to lose the thread and got ground down. He noted afterwards that his time handling had let him down, as he was unable to navigate the complications. 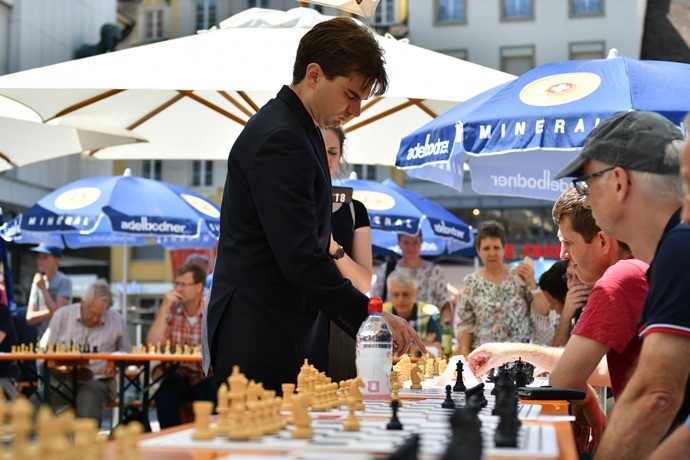 Things looked bleak for Morozevich as he faced top-seed Navara with the black pieces in Round 2, but he played a line of the Benoni he said he’d looked at 4-5 years ago and soon had the advantage. He even got to play another knight sacrifice on d5! 23…Nxd5! Obviously the knight can’t be taken, while an attempt to regain the pawn with 24.Rxc4 runs into 24…Bb5! immediately, or even better after taking on f4 first. Morozevich didn’t put a foot wrong and afterwards talked to Danny King, explaining why it’s true that he hadn’t played a single classical game this year. If you’re an elite tournament organiser it’s worth noting the maverick Morozevich is open for invitations! …but 32…Bxb5! was just enough counterplay to draw, since after 33.Nxb5 e2 34.Kd2 Rf1! 35.Kxe2 Rxh1 Black had lost the precious e-pawn but restored the material balance.